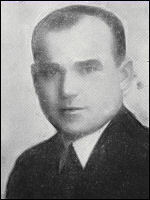 Zakomorny, Mykola [Микола Закоморний] – biochemist; born on 21 November 1901 in Yasynuvata (Donetsk oblast, Ukraine; at that time – Yasynovate, Bakhmut county, Katerynoslav gubernia, Russian Empire); died on 20 February 1982 in the village of Offley, Hertfordshire, England, United Kingdom. In 1913-1918 Zakomorny attended a commercial school in Yenakieve, but his education was interrupted by the outbreak of the First World War. He joined the Army of the Ukrainian People’s Republic (UNR) in March 1920 and took part in the struggle for Ukrainian independence. Initially he held the rank of chotovyi (equivalent to staff sergeant), and was later promoted to khorunzhyi (second lieutenant). After the failure of the independence struggle, together with the retreating UNR forces, he crossed the river Zbruch into Polish-held territory and was subsequently interned in Poland. He attended a Realschule secondary school in the Szczypiorno internment camp, and then graduated from the Taras Shevchenko gymnasium secondary school at the camp in Kalisz. In 1924 he left for Czechoslovakia, where he enrolled in the Department of Chemical Technology, Faculty of Engineering, at the Ukrainian Husbandry Academy in Poděbrady. In 1928 he served an apprenticeship at an oil refinery in Drohobych, Galicia. He graduated from the Academy in 1929 with a degree in chemical engineering. While in Czechoslovakia he was also active in the Plast Ukrainian Scouting Organisation, and published several articles on Plast in the Molode Zhyttia journal and other periodicals. He subsequently relocated to Poland where, from 1929 to 1942, he worked at the University of Poznań. In 1932 he became an assistant lecturer at the university’s Department of Agricultural Technology. After gaining a doctorate in biology in 1939, he became an associate professor of the Department. During this period he co-authored a number of handbooks in Polish (see below) as well as several articles in German in the Biochemische Zeitschrift journal. His main academic interests were in the areas of fungal-related chemical processes in organic compounds, and the biochemical analysis of the components of hops. Towards the end of the Second World War he emigrated to Germany where, from 1944, he lived in various displaced persons camps. From 1945 to 1947 he was professor of chemistry at the Ukrainian Technical and Husbandry Institute in Munich. He was a Full Member of the Shevchenko Scientific Society (NTSh) in Lviv (from 13 July 1942), and one of the earliest Full Members (from 8 June 1947) of the NTSh which was revived in Germany after the war. In 1947 he emigrated to the United Kingdom and initially settled in Manchester. In February 1948 he became head of the research laboratory of the Institute of Brewing, located at the Manchester Municipal College of Technology. He remained in this post until 1950, after which he moved to Luton and became chief chemical engineer at the J. W. Green Ltd brewery (merged with Flowers Breweries Ltd in 1954). In June 1951 he became a member of the Institute of Brewing, and in 1952 published two articles in the Journal of the Institute of Brewing. In 1962 he moved to Offley, near Luton. He continued to work at Flowers Breweries until his retirement in November 1966. He was a member of the Society of Ukrainian Engineers in Great Britain, formed in January 1951. His publications include: Dymitr Tiukow, Mikołaj Zakomorny, O tryptofanie w mleku krowiem (Poznań, 1934), Tadeusz Chrząszcz, Mikołaj Zakomorny, Teoria i praktyka gromadzenia kwasu cytrynowego przez pleśniaki w procesach biochemicznego rozkładu cukru (Poznań, 1934), Tadeusz Chrząszcz, Mikołaj Zakomorny, Degeneracja biochemicznych własności silnie kwaszących kultur Aspergillus niger (Poznań, 1939).